We got brave and decided to take our first family camping trip. The scenery was amazing at the campground that was hosting the weekend-long bluegrass music festival. We camped with friends who also had kids (misery loves company I guess!) and had a great day and night listening to music and playing in our campsite. Weather was so perfect we even got to enjoy a swim in the Potomac. Then the hail storm came. At first it was just huge droplets of rain that were welcome relief from the heat. But then the sky got dark. and loud. and angry. The wind gusted, thunder and lightning warned, and we all ran. I was pushing the two kids in our double stroller and doing my best to keep them sheltered while pushing through crowds. Right after we got to a pavilion, hail pelted down. We were all awestruck. The storm lasted what felt like days but ended up being a bit over an hour. Our tent poles were broken, our sleeping bags were floating in icewater and a tent just feet from our was flattened under a massive tree. Shortly after throwing our sopping wet gear into my in-laws minivan and hitting the highway for a dry, indoor bed, Nate and I were debating the ranking of this trip in our "worst camping experiences" list. It definitely was the wettest (although we both thought of a few that were close runners up!) but the good times made the craziness seem worth it. 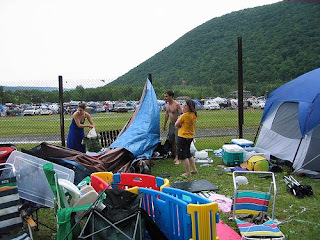 I can recall camping disasters with my parents growing up and so can Nate. I guess our kids are doomed! Why does Ensley look so happy about the whole thing?!! You may have hated it, but it will be a weekend you'll never forget!